You’re Clark Kent, a little boy who’s way different than your parents or anyone else in your hometown of Smallville. One day, you start floating high into the sky. Who the heck is going to show you how to fly? Superman: American Alien is another origin story for the Man of Steel. Except that it isn’t. The focus in the American Alien miniseries is going to be on how Clark Kent grew up into a man, not a superhero. Written by Chronicle screenwriter Max Landis with art by Nick Dragotta, the first issue is focused squarely on the Kent family on their Kansas farm. It opens with a scene where a pre-pubescent Clark is drifting away into the sky, with his mom clinging on for dear life. After mother and son return safely to terra firma, Clark displays believable moments of guilt and shame. He feels like a burden to his parents. They, in turn, do what many young parents do when dealing with abnormal behavior: get a doctor to weigh in. One thing that’s surprising is how open and un-paranoid American Alien #1 feels. It’s been a staple of latter-day Superman origin stories to assume suspicion and distrust on behalf of the general populace. But, aside from the doctor, a few other people are made privy to the fact that Clark is different. The Kents are not exactly in hiding and there’s a sense of implicit trust in how they deal with their neighbors. and Clark takes it pretty badly. As seen in his Mickey Mouse “Boy’s Night” comic strip collaboration with Ashley Quach, Landis has a knack for deconstructing big pop culture icons. 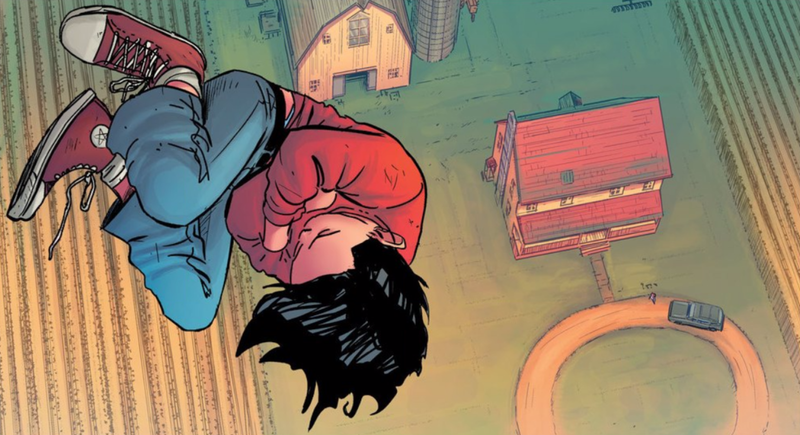 In American Alien #1, you get a sense of the community that nurtured a young Clark Kent so that he grew up into a Superman who’d want to save the world. After Clark gets the hang of flying at the end of American Alien #1, he goes wild fantasizing what he can do with this newfound ability. It’s a great beat that rings true to the unbounded imaginations that rattle around in kids’ heads. All throughout the issue, Dragotta’s loose energetic linework helps sell the emotions and reactions moving through Clark and the people around him. DC Comics has been doing a lot of different things with Superman of late. The mainline Superman has had his secret identity outed by Lois Lane and suffered a downgrade in his powers. The capeless, de-powered Clark has come across as angry and grumpy at times. And, while his predecessor from a previous multiverse seems more well-adjusted, the older Superman in Superman: Lois & Clark #1 is in fact hiding, living a smaller, less symbolic life so as to protect his wife and son. With all the louder dramas that have blown through Superman’s life of late, American Alien’s lo-fi, down-to-earth focus makes for a nice, heartwarming change.